Amatrol’s Inspection & Indexing Station (87-TMS2) is an electrically powered learning system that focuses on how automated gauging is used to inspect parts before they move to the next step in the process. It features an electric stepper motor, three different industrial sensors, a 3-color stacklight, an AB1000 PLC, 10 inputs, 6 outputs, and much more! The 87-TMS2 is a portable, durable, affordable solution to provide mechatronics training and build real-world skills for careers in this vital industrial area. 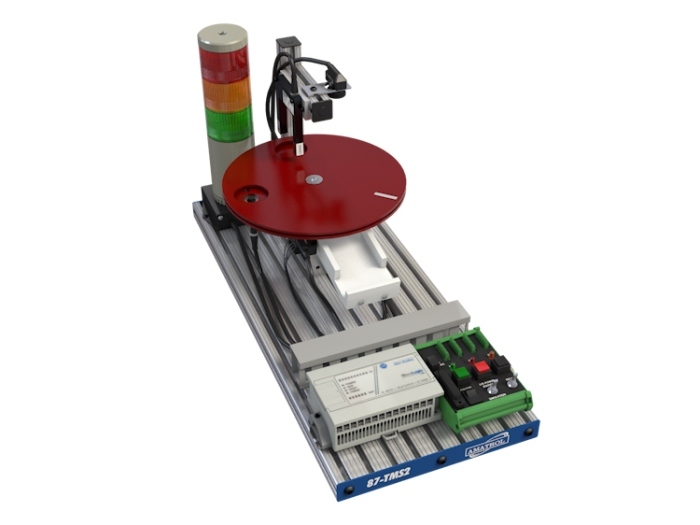 It can be used as a stand-alone system to teach inspection and indexing skills or it can be combined with the Inventory Feeding Station (87-TMS1) and the Sorting & Distribution Station (87-TMS3) to form a fully automated line on a tabletop! The 87-TMS2 curriculum features an astounding breadth and depth of automation topics and skills. Key learning areas include: index station operation; adjustment of fork, homing, and proximity sensors; stepper motor programming; homing sensor adjustment; stepper motor index table sequencing; index station sequencing; and much more!